It’s your Med School too — what are your hopes? This is a special day. And a happy one. Less than 18 months ago, Travis County voters passed Proposition 1. We voted to invest in and partner with — in a meaningful, personal way — a medical school that promised to transform our region’s healthcare and economy. And as of today, the construction of this transformative project is officially underway. 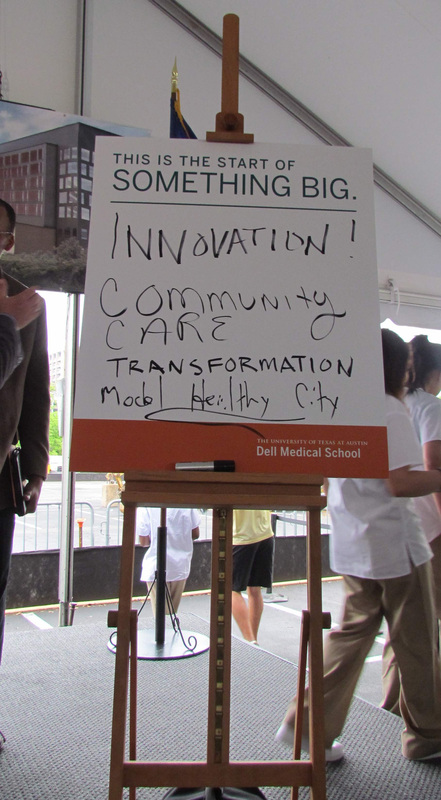 Hundreds of folks from across our community came out to a ceremony that will launch the construction of the Dell Medical School at the University of Texas. I’ve been in Austin for a long time, so I’ve seen more than my share of happy, special days. But I don’t think I’ve ever seen a moment quite like this one. Normally, ceremonies like this are called “ground-breakings.” A bunch of swells will stand around in suits, wearing hardhats, carrying ceremonial shovels, and stick those shovels into the ground to symbolically start construction. 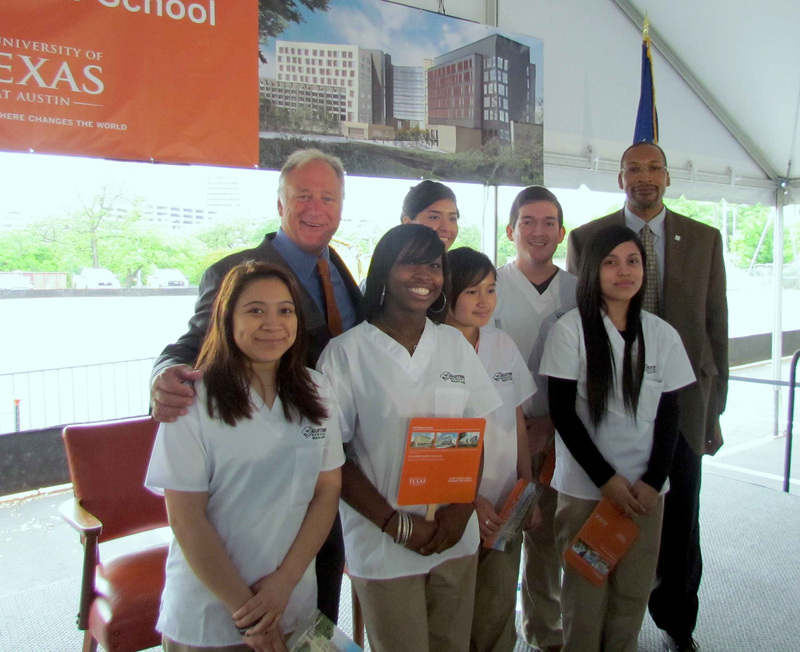 That was a little, well, boring for our brand new, cutting-edge med school. So, instead, all of us — you, me, everybody — have been invited to offer hopes and aspirations for the medical school and what it will mean for our community. Submissions of hopes and aspirations will be incorporated into the med school’s design and decoration. It’s a phenomenal way to be a part of this tremendous project. Email them directly to the school at SocialDellMed@utexas.edu. Seriously, let us hear it. Like, right now. #IHopeDellMed. The tweets don’t tweet themselves, people. 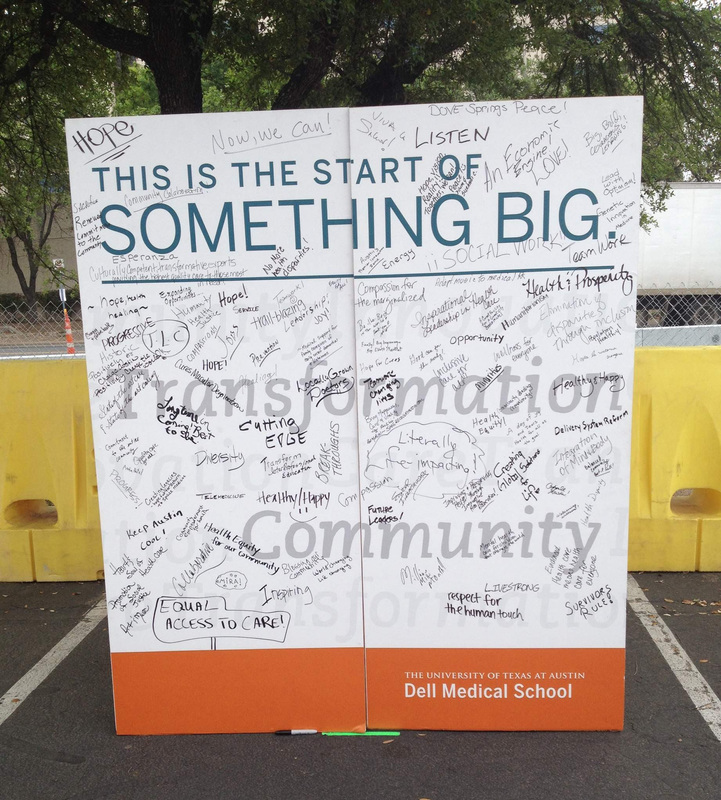 My word — my aspiration for the Dell Medical School — is “transformation.” That’s what I hope and believe we’ve sparked today. … A transformation in how healthy people stay healthy. … A transformation in how sick people get well. … An economic transformation in the innovative work people will be able to do; the research, therapies and devices they’ll produce; and the benefits we’ll receive from it all. 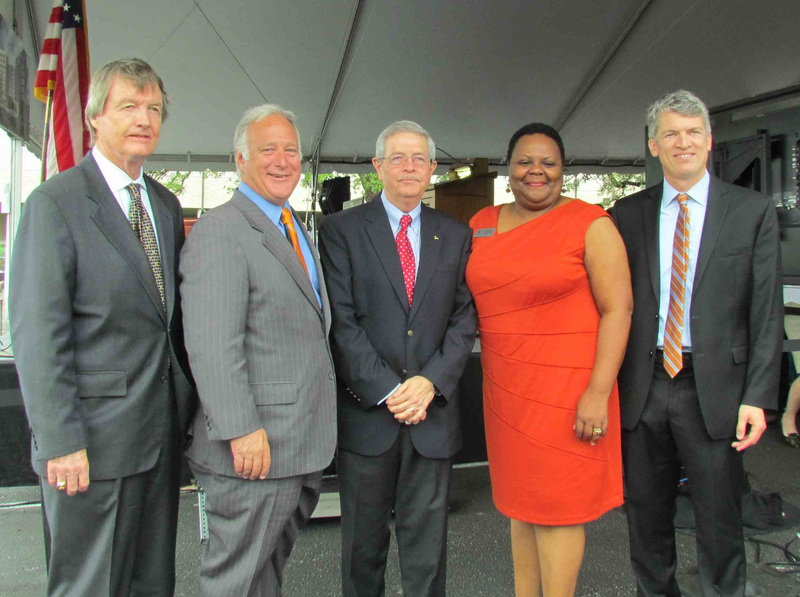 … And an educational transformation in the opportunities that will be available not just at UT, but also in schools and colleges across our community. I had the honor today of recognizing youth in the health professions clinical rotation program at Eastside Memorial High School. It’s a great group of kids, and I’m so glad they could attend this historic event. For them and others like them, this medical school represents a neat new chance to learn about health and healthcare, and to put that knowledge to work in our community. Like them, we’re all going to experience this transformation. It will be big. Really, it had to be big. I don’t know that this community would’ve come together for something folks might or might not notice as they went about their lives. Instead, we invested in something that will change what it means to live in Central Texas. We invested in transformation. And that’s what we’re going to get. Make no mistake — today wasn’t just about three new buildings on our skyline. Our community will be different — healthier and stronger — thanks to this project. We’ve come so far, so fast, to get here today. 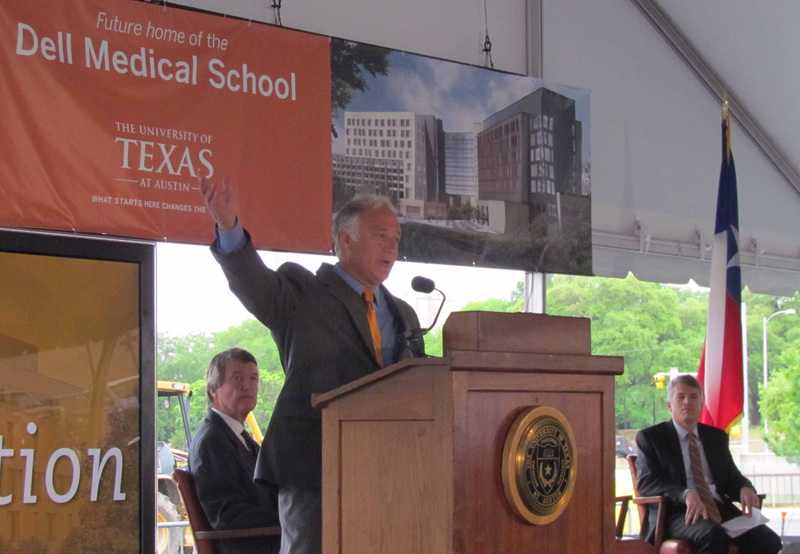 For generations, we’ve shared this goal of creating a medical school at UT. And today, together we’re in sight of accomplishing our goal. The transformation we’ve hoped and worked for is finally on its way.